The location and frequency of spawning (reproduction) in fish has a direct effect on the abundance, stability, and resilience of a fish population. Major storm events, such as hurricanes, provide a natural experiment to test the ability of a fish population to withstand disturbances. Acoustic monitoring of Spotted Seatrout spawning revealed that these fish are extremely productive, spawning every day of the spawning season (April – September), including during a category 4 hurricane. These results illustrate the amazing resilience of estuarine fishes to intense disturbances and their potential to cope with projected increases in extreme weather events in the future. Spotted Seatrout and many other species of “drum fish” make characteristic sounds during spawning (figure 1), which can be heard on underwater microphones, or hydrophones. This allows us to remotely monitor when fish spawn and how long they spawn for, which is especially helpful in murky water, where it is difficult to see. Seatrout spawning can be identified within the audio recordings by analyzing the intensity of the sound within the specific frequency range (250-500 Hz) of the Spotted Seatrout calls. Figure 1. Recording of male Spotted Seatrout drumming sounds during spawning. We monitored Spotted Seatrout spawning from April to September 2017 at 15 sites within the estuaries of South Texas, to see how changes in environmental conditions affected spawning. Our study also coincided with a category 4 hurricane. Hurricane Harvey made landfall 9 km east of Rockport, Texas on August 25, 2017 at 17:00 h CST. The eye of the storm was 28 km wide, maximum sustained winds were 59 m s-1 with gusts up to 65 m s-1, and the storm surge caused water levels to rise 3.8 meters above ground level. The sound pressure level within the frequency range of seatrout spawning sounds peaked every evening between 20:00 and 21:00, indicating that spawning was occurring on a daily basis. During the hurricane wind-associated noise masked any potential spawning sounds, except at two stations that were directly in the path of the hurricane. 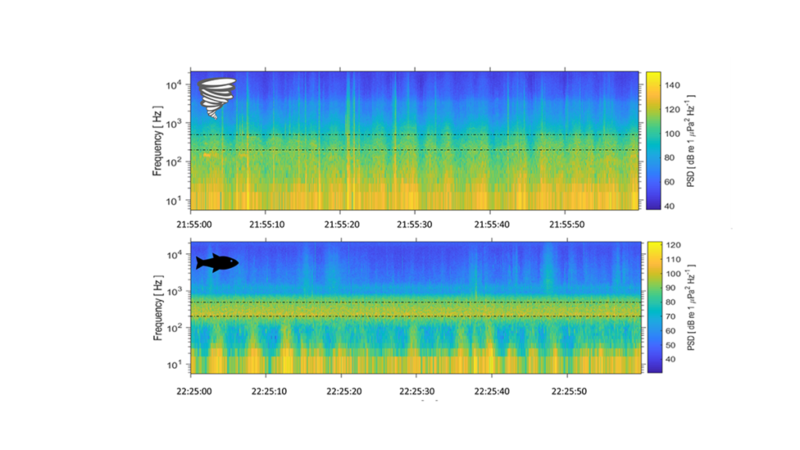 When the eye of the storm was directly overhead those stations, wind-associated noise decreased, and spawning sounds were audible (figure 2). The time that spawning began shifted two hours earlier for five days after the storm, which may have been partly caused by the decrease in water temperature. Figure 2. Spectrograms of recordings during Hurricane Harvey showing storm noise at 21:55 and seatrout chorusing at 22:25 within the 250-500 Hz bandwith (dotted lines). Species that live and spawn in estuaries must deal with conditions that can change rapidly and unpredictably. It is important to understand how those changes impact spawning activity in order to maintain sustainable populations for the fishing industry. 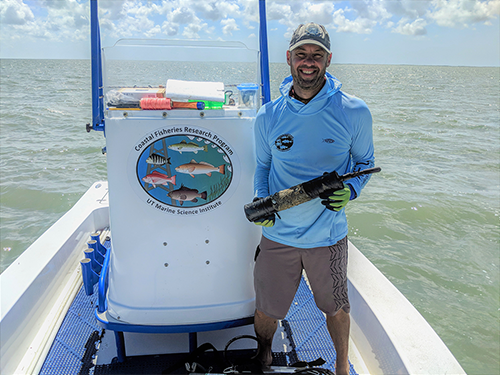 Further, understanding how fish respond to environmental disturbances in these environments may offer insight on how fish will respond to climate change and other human impacts elsewhere.